With this 10-drawer slim storage tower you can add that needed storage to any room in the home. 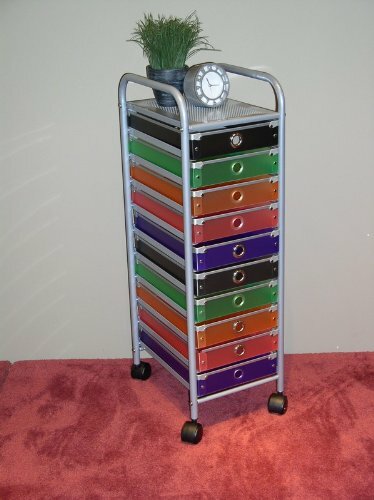 The 10 drawer (Inside dim 9 3/4-inch w by 14 1/8-inch l by 2-3/8-inch h) multi colored foldable polypropylene drawers snap together with silver buttons and come with a decorative silver railing around the top of the drawer. The silver colored finger pulls make it easy to pull the drawer in and out of the unit. The frame is made out of metal and is then powder coated to give it a durable surface. The 10 drawers rest on a metal rail on the frame and come with a stop on the back. The perforated metal top offers a sense of style to the top of the unit as well as adding additional storage. Rounding the top and having 2-inch casters make this unit easy to move around the home. Clean with a dry non abrasive cloth. Assembly required. If you have any questions about this product by 4D Concepts, contact us by completing and submitting the form below. If you are looking for a specif part number, please include it with your message.